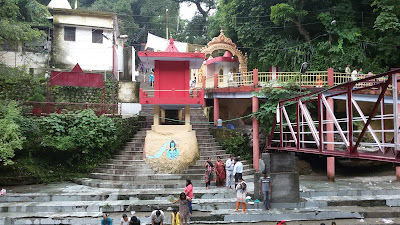 Tapkeshwar Mahadev Mandir is the most famous Lord Shiva's temple of Dehradun. It is popular by various names as Tapkeshwer Dham, Tapkeshwer mandir and Tapkeshwer temple. Tapkeshwar Shiv temple is a natural cave which is situated near the Tons River. This cave is also famous as 'Dron Cave' because Guru Dronacharya did 'Tapasya' here. There is a Swayambhu Shivling inside the cave on which water drop fall naturally and regularly. That’s why this Shiv temple called as Tapkeshwar. Around the temple, greenery, river, and springs make this place naturally beautiful. History of Tapkeshwar temple starts with Guru Dronacharya. Guru Dronacharya came here for doing Tapasya of Lord Shiva. They did twelve years Tapasya for Lord Shiva. Guru Dronacharyawantst to learn archery from Lord Shiva. Guru Dronacharya's wife wanted a child then they again start Lord Shiv worship. After some time, Guru Dronacharya's wife gives birth to a baby boy. Guru Dronacharya named the child as Ashwatthama. Ashwatthama does not drink the milk since birth so he doesn't know about the milk. Once he knows about the milk by his friend. So he demanded the milk from his mother. Ashwatthama’s mother was unable to give him milk. Then Ashwatthama goes to his father, Guru Dronacharya for milk. His father was also unable to give him milk because he had no cow. Guru Dronachrya suggested to Ashwatthama to do Tapasya of Lord Shiva for the milk. Ashwatthama started the Tapasya of Lord Shiva. He did very hard Tapasya for Lord Shiva by standing on a single leg. Lord Shiva very happy with Ashwatthama Tapasya and came to in front of him. Lord Shiva asked to Ashwatthama for demanding his wish. So Ashwatthama demanded milk. Then the stream of milk started from the cave and dropping on Shivling. Ashwatthama drinks this milk from the Shivling's feet. Later on in Kalyug due to misuse of this milk, this milk turns into water. Tapkeshwar Mahadev Temple has self-manifested (Swayambhu) Shiva Linga. Tapkeshwar temple is popular as Guru Dronacharya Tapasthali and Dron Gupha. Tapkeshwar temple also famous for Ashwatthama birthplace. 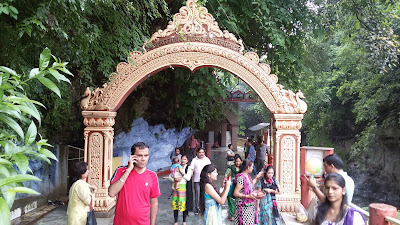 Natural cave Shiv Temple of Dehradun. Ancient Shiv Temple of Dehradun. After Ashwatthama's Tapasya, Lord Shiva blessed to him in Tapkeshwar temple. So there was continuously milk dripping on Shivling. So that time this temple was popular as Dudheshwar. Tapkeshwar temple another ancient name before Dudheshwar and Tapkeshwar was Deveshwar Mahadev Mandir. 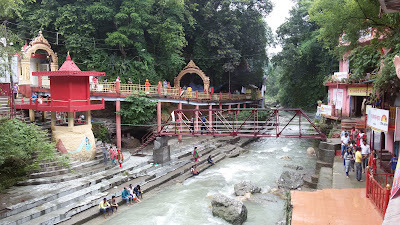 There are many Shiv temple in Dehradun such as Shri Prakasheshwar Mahadev Mandir. Tapkeshwar temple of Dehradun is Prachin Shiv Mandir because the temple is old than the Mahabharata times. ‘Prachin’ is a Hindi word used for very old and historical things. The description of Shri Tapakeshwar Shivling found in Kund Puran Kedar section as the name of Deveshwar and Tapakeshwar. So it is believed that this temple is about six thousand years old. Tapkeshwar Dham means where Tapkeshwar God stay. Both side area of Tons river of Tapkeshwar temple known as Tapkeshwar Dham. There are also other Gods temples and statues on the other side of the Tons River. You will find Guru Dronacharya’s temple also here. Other than Tapkeshwar temple, other Gods temples are listed below. There is two Shiv Linga in the Tapkeshwar temple. Both are believed self-manifested (Swayambhu). There will be continuously water dripping on main Shiv Linga. The other Shiv linga covered with the Rudraksha. For cover the Shivling there was 5151 Rudraksha used. Shiv devotees can see both Shiv linga and worship them. Rudrakshmay Shringar of Shivling occurs on every Trayodashi of the month. Rudrakshmay form of Shivling called Deveshwar Shiv. Shivling's special Shringar (makeup) called Tapeshwar Mahadev which occurs on every Sunday and Thursday. During Sawan month special worship of Lord Shiv every day. Special worship of Shivling with Shringar on Monday. On Mahashivratri magnificent worship of Shivling. Grand worship with decor during Navratri. Tapkeshwar temple is situated on the side of Tons River. Tons river is tributary of Yamuna River which flows through Garhwal region. Tons river in Mahabharata times called as Tamsa. Its other name was Devdhara. There is a small bridge on the Tons River for going another side of the river. During the summer water level of this river becomes low. But during the rainy season, the water level becomes so high and temple maximum parts go under the river water. Except for rainy season, you can take bath also in the Tons River. Many Shiv devotees go for Shiv Darshan after taking bath in Tons River. There are lots of fishes in the River. So you can feed them here. Foods for Fish also available here. There is also sulfur- water springs near the temple. Dehradun is a hill city so during the rainy season water level of rivers going suddenly so high. So avoiding such places for traveling during in rainy season is a better option. In 2017 many pilgrims were trapped in Tapkeshwar temple. The sharp rise in the water level of the Tons River due to the heavy rain that the surrounding stairs were sunk. Due to the thunderstorm of Tons River, devotees could not get out of the temple for three hours. Tapkeshwar temple is open on all days of the week. The temple opens in the morning at 06:00 am and closed in the evening at 07:00 pm. There are no entry fees for the entry in the temple. From the main entrance to the temple, there are 300 stairs. It is difficult for elderly people to go up or down using stairs. There is a new electric lift is started for the elderly people and incapable peoples who want to visit Tapkeshwar temple. For the lift using there is minimal charges of Rs. 50/-. 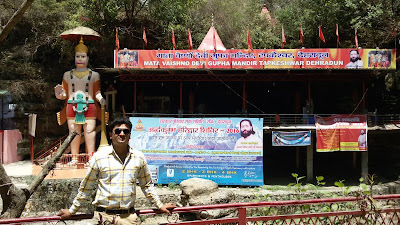 As per climate of Dehradun best time to visit Tapkeshwar March to May and August to November. During December to February, very Dehradun becomes very chilled. As per festivals time, you can go there at Mahashivratri. During the Hindi Sawana month, lots of Lord Shiv devotees come to Tapkeshwar temple. Tapkeshwar temple is situated near to river so you have to avoid visit here during the rainy season. Annually there is a huge fair is organized on the holy festival Mahashivratri. On this day lots of devotees of Lord Shiva come from various places of Dehradun and from nearby cities to visit here. So if you want to visit this place on this day you have to come as soon as possible in the early morning. There will be a long queue of men and women devotees’ separately. Various types’ shops arrange during this festival. Various types of Jhula for kids and youngsters will be here. During this festival, you will found various shops offering Bhang laddu, bhang sharbat, Bhang Pakode etc. You will also found Kandamool fruit also during this festival. Free Prasad and food distributions are arranged by the temple committee during the Mahashivratri for all devotees. Parking space is available for two or four wheeler vehicle but there is no parking stand. So parking is on your risk. The camera allowed in the temple. So enjoy photography with natural beautiful location. Slippers or shoes are not allowed in the main temple so keep outside the temple or keep it at Prasad shops. There is less space in the cave and it may be slippery. So move slowly inside the temple. There will be snakes in Tons River or sides of the river to keep it in mind. Keep kids with you. Kids can move here and there in the temple. There are lots of shops of Prasad near to Tapkeshwar temple main gate. They offer you Prasad at different rates such as Rs. 21/- to 151/-. You can take milk or water for pouring on Shivling. After worship of Lord Shiva, you can take snacks here. There are small refreshment shops which offer you many foods and drink items. 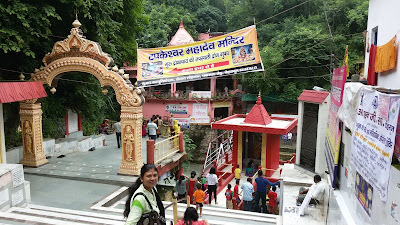 Tapkeshwar temple is situated in the Garhi Cantt, Dehradun. It is approximately 6 km from the main city of Dehradun. You can get direct city bus service from the ISBT bus stand for the Garhi Cantt. The Tapkeshwar temple is approximately 2 km far away from the city bus stoppage of Garhi Cantt. You can also go there without any vehicle. It will be 15-20 minutes walkable distance if you are single. You can book private taxi or cab it will be a good option for going Tapkeshwar temple from anywhere in Dehradun. If you have own vehicle it will be best. From Dehradun Railway station: It is only approximately 7.5 km from the Dehradun railway station. There is city bus stoppage at railway station so you can go direct Garhi Cantt or Ballupur chowk. From Ballupur chowk you will get Bus or taxi for go to Garhi Cantt. From Dehradun Bus Stand: The distance between ISBT bus stand and the Tapkeshwar temple is 9 km. There are a direct bus and taxi services for the Garhi Cantt from the ISBT bus stand Dehradun. From Dehradun Airport: The distance between Jolly Grant Dehradun airport and the Tapkeshwar temple is 35 km. So booking private taxi or cab is the best option from the airport for visiting Tapkeshwar temple.